Google has announced the new version of its Instant Previews feature, which we discussed in August during Google’s testing. The new mouse-over feature makes it easier to quickly view previews of websites in the search results without having to visit the website first. The change from Google’s last version of Instant Previews is quite significant in that rather than having to click on a small magnifying glass icon, an instant preview tab now appears when you hover over any part of the search result; you then simply hover over the tab to bring the preview into view. Also of note is that the ‘Cached’ link now appears above the instant preview rather than alongside the web address. This reduces the clutter around the main search result and relegates a feature that was surely not used by the majority of Google’s audience. Searching for a website that has a specific image on it is where Google Instant Preview comes into its own. It now takes just seconds to hover over the previews of 10 or so websites to find out which website has the photo you’re looking for. What Does the New Instant Previews Mean for Website Owners? Google has now made Instant Previews more obvious and it’s now more likely that people will evaluate your website visually before visiting, or not visiting as the case may be. If the searcher doesn’t see what they’re looking for in that split second, then they will simply move their mouse onto the next preview and your website is gone. A process which usually involves visiting your website is now void of that one big ‘time consuming’ step. 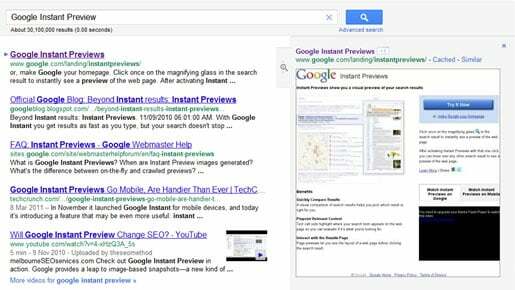 Will the masses actually use Google Instant Previews? The actual Instant Previews feature isn’t new, but Google has obviously seen the need to make it more obvious and make their search results easier to use. There’s a strong chance that a much larger proportion of Google’s audience will use it and this could mean that the percentage of searchers who visit your website will drop if they deem your website to be irrelevant. That all depends on whether it does make it easier to evaluate pages; is there enough information in the preview’s text and visuals to decide not to visit your website? The number of people using it is likely to increase over time and as a website owner you can’t afford to lose traffic. Stand back and look subjectively at your website’s instant preview. Does your website look professional, does it look inviting? Does it look clean, uncomplicated and easy to use? Does your text look easy to read, rather than being grouped together in one or two big clumps? Start with the aesthetics and get those right, then hopefully the content that Google highlights is the content that motivates the searcher to click.